It's Just the Coffee Talking: Coffee-mate is taking to the streets in 5 cities next week.... is one of them yours? Coffee-mate is taking to the streets in 5 cities next week.... is one of them yours? Friday, March 23, 2012 has officially been renamed Free Flavor Friday. 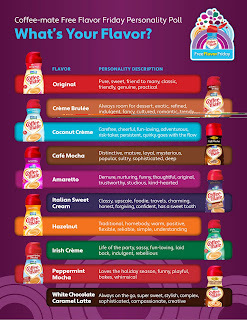 Did you know Coffee-mate has over 25 different flavors? 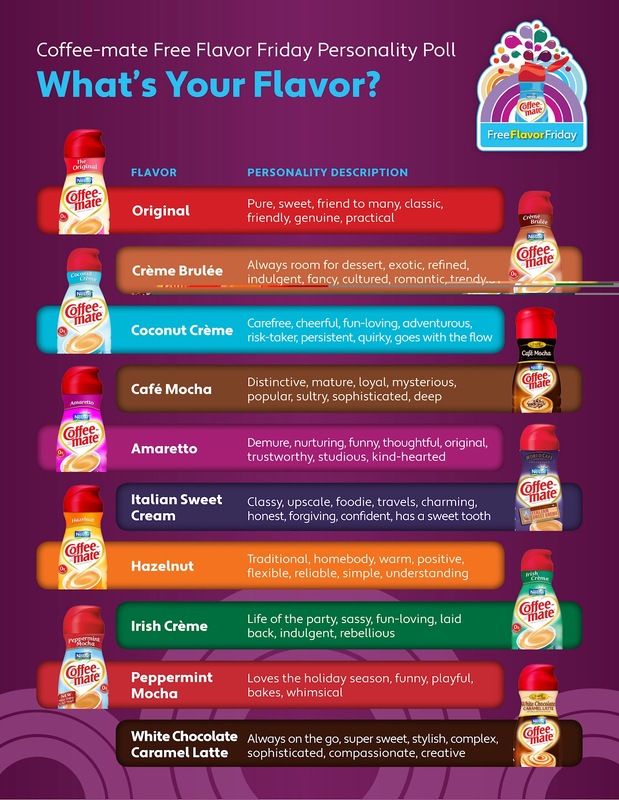 On Friday, March 23rd, Coffee-mate will be taking to the streets of Boston, Chicago, New York, Seattle and San Francisco to distribute 125,000 free product coupons and asking consumers their favorite flavors. Unfortunately I do not live near any of those cities anymore... but if you, be sure to keep an eye out for Coffee-mate and snag a free coupon and vote for your favorite flavor. I am not near any of the cities for Free Flavor Friday, but I still participate through activities with the Brew Crew and letting family and friends know of the events!! I love Coffee-Mate products and use none other!!! 1rejellybean, I am a member of the BrewCrew@CoffeeMateUSA. I am a member of the @coffeemateUSABrewCrew and am so super excited about free flavor friday. 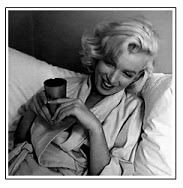 I love coffee and drink it all day. Can't wait. I don't live near one of the places either, but I will be getting one online! Becky@coffeemateUSA Brew Crew!! oh how i wish my city was one of the locations, but no matter, i'll be participating online via the FFF website and on the brew crew site. I am very excited about free flaovr friday and I am also very appreciative that coffe mate is doing this for its fans and brew crew memebers, i am unfortuanatly not in any of the cities listed but I will keep an eye out if they ever head on down to south FL!! Thank you for sharing! :) I am so excited for Free Flavor Friday! I do not live near any of the cities. wish i could be there in person but i will be checking the coffee-mate website on friday! Love the blog! Im so excited about Free Flavor Friday! Im a brew crew member @coffeemateusa! I love everything coffeemate! Unfortunately, I do not live near any of the Free Flavor Friday cities. But I am lucky enough to be a member of @Coffeemate USA Brew Crew. I was a featured office party last year and had a blast!!! So many people were unaware of the flavor offerings! Excited again this year!!! I wasn't near any of the cities for Free Flavor Friday, but I was selected to host a Free Flavor Friday - and I chose to host it at my work place. It was a blast sharing all of the different flavors with my coworkers and frineds. They had so much fun trying out flavors that they normally would purchase on their own. I am a member of the @CoffeemateUSA Brew Crew. I am also not near any of these cities (by the way, I do think Orlando would make a GREAT city for an event like this, what with all the attractions and all). However, I was able to participate with a free product coupon as well. Hi! While I don't live near any of these cities (by the way, don't you think Orlando would be a GREAT host city for a coffeemate event?!! Attractions, visitors, etc.). However, I was able to participate with a free coupon and of course, I made myself coffee!!!! I loved Free Flavor Friday and although I live in the Chicago land area I was not able to attend a Free Flavor Friday event. I got my free coupon and I am so excited! I will use the coupon to try a new flavor of Coffee-mate! I also got my sister to become a fan of Coffee-mate on Facebook. I really enjoyed Free Flavor Friday and I celebrated at home. This was a great event! Thank you Coffee-mate!